German Chancellor Angela Merkel’s days in big politics are reportedly numbered, according to Russian media. However such predictions are unfounded given that publicists have long been using phrases like “it is time for Merkel to go” as tropes (meaning we want someone else but we do not know whom). Russian propagandists are taking cue from the Kremlin strategists seeking to divide Europe by toppling its strongest leader. The September parliamentary elections in Germany did not lead to the removal of Angela Merkel, whom the Kremlin hates. However, both the CDU (Christian Democratic Union of Germany) and the SPD (Social Democratic Party of Germany) got the worst results in the post-war history, which prompted many analysts to conclude that the elections in Germany were won by Putin. Although relevant headlines were deliberately dramatic, it is still a fact that the ring-wing populist Alternative for Germany (AfD), which is openly pro-Moscow, turned out to be the third most popular political party. It is an open secret that the Christian Democrats lost their traditional voters because one of the main issues during this election campaign was the migration crisis, which I covered below. In this context, it should be noted that this problem is still a useful tool for attacks on Chancellor Merkel. When the present the chancellor formally won the election, it became obvious that there are many people who would like to continue to destroy the unity of Europe by attacking its most consistent defender. What is the purpose? Ultimately, to get pro-Russian forces, individual politicians and "Putinverstehers" involved in big German politics (in all federal states). Or at least to generate messages required by Moscow in the German political domain (while creating the necessary information background). At most, to build serious political influence in the country. Several months after the elections in Germany, some areas of Kremlin sympathizers’ work became visible. In particular, the pro-Russian lobby has been making every effort to ensure that the chancellor finally loses her political position and later her post (it would give them new strength to ruin the EU sanctions policy against Moscow). And now Russian propagandists are acting in advance to persuade the common audience that Merkel does not have much time left. A little less than the West at all. 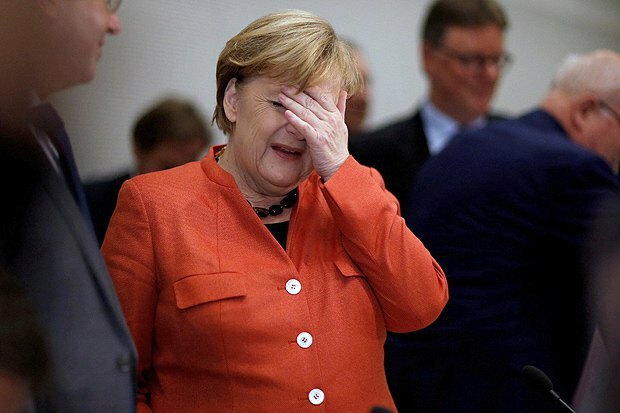 “Angela Merkel won the election but failed the negotiations to form a new coalition. Even if she succeeds in forming her fourth government, it will not last long, and her party will be represented by a different leader in next elections. 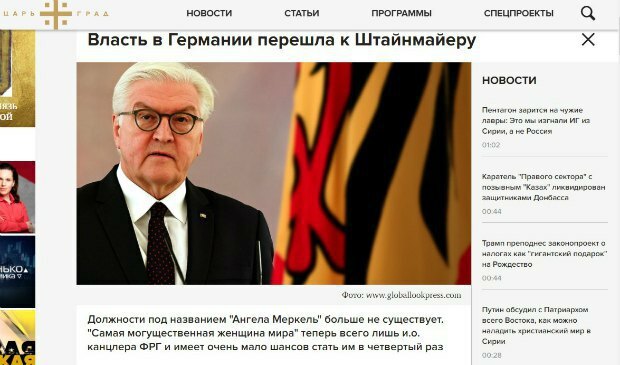 While it is difficult but possible to find a substitute for Merkel in terms of Germany’s domestic agenda, there is a huge problem with the pool of candidates for another role she was tried for,” the Vzglyad website close to the Russian presidential administration says in the article with the eloquent title “The crown of the West proves too big for Angela Merkel”. Dni.Ru, yet another “dump”, is even more categorical. The headline promises that “the days of Merkel are numbered”. “The political career of German Chancellor Angela Merkel is coming to an end. The unconvincing score in the parliamentary elections and the inability to form a new government are to blame,” reads the article lead. 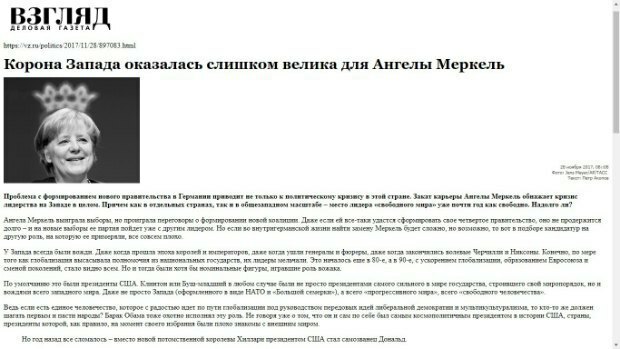 However, given the pace of “Merkel’s fall”, they did not have time to write a separate article, so they had to use the one from Vzglyad. The most professional were the employees of the Tsargrad website (or their handlers, it does not matter). So, on 22 November, they published their own article entitled "Power in Germany handed to Steinmeier." "There is no longer any such post as ‘Angela Merkel’. ‘The world’s most powerful woman’ is now only the acting chancellor of Germany and her fourth term is very unlikely," one Sergey Latyshev shares his “insight”. These are just a few examples, there are plenty more Russian media reports on the matter. So, as Vysotsky said in one of his songs, Merkel “just needs to get a shot and fall to the bottom of a well". Although she is unlikely to know about Tsargrad’s “exclusive” reports. After all, they conclude that the political career of a leading world politician who has just won the election is about to end simply because the government formation has taken more time than expected. There is no secret that Moscow began “to bury Merkel” (as well as the whole united Europe) in 2015 after Germany, as the undisputed leader of the European Union, slapped Russia with sanctions over its occupation of Crimea and invasion in Donbas. Over the time, the restrictions on the aggressor state have not been cancelled but consistently tightened. So, faced with the fact that most countries are not going to turn a blind eye to the paroxysms of the “evil empire”, the Russian Cheka resorted to the experience of its predecessors and decided to "foment the world fire" to “upset all the bourgeois”. Russia officially became a party to the conflict in the Syrian war by bombing Syrian cities, as a result of which a controlled flow of refugees from the Middle East rushed to Europe. This led to the migration crisis, the resolution of which completely fell on Merkel as the leader of the leading country of united Europe and forced her to make unpopular decisions. Naturally, amid the migration crisis, Europe was hit by terrorist attacks for which ISIS claimed responsibility (ISIS was reasonably suspected of having links with the Russian special services). Last year, acts of intimidation reached Germany. Of course, on the eve of the parliamentary elections, which later ... Read above. Obviously, the German rightists with a clear Moscow trail got particularly active during this period. And because there is never too much of a good thing, the memorable "girl Liza" could not but make an appearance and make the Russian federal mass disinformation media so “compassionate”. Having read what I have said above, one can certainly continue to believe that "sanctions do not work" and that "Iskanders are not afraid of sanctions". However, the wind sown by Russia will continue to reap the whirlwind which will kill further and further. If only virtually and political careers only.